For Jared and Izabella’s wedding shower, Natalie’s sister, Valarie, made a wonderful chicken salad that came from her daughter Hilary’s recipe. There were many requests at the shower for the recipe, so here it is. This is an easy-to-make healthy recipe that can easily be scaled up for a crowd. Valarie says that the salad is also delicious when served in taco shells. Simmer the chicken breasts in water until done, about 45 minutes. Break Ramen noodles into small pieces, and mix with almonds and sesame seeds. 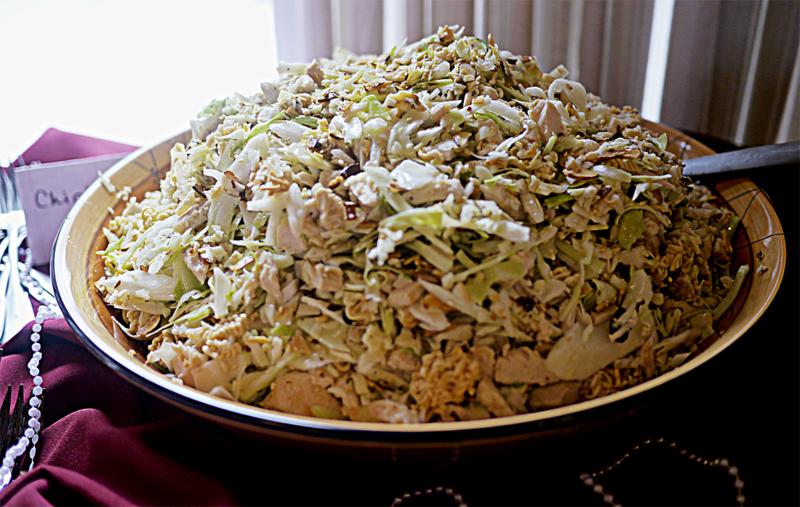 Dice the chicken and mix with the shredded cabbage. Mix the dressing ingredients together and shake well in a sealed container. Add the dressing and the noodle, almond and sesame mixture to the cabbage and chicken, just before serving. Adjust the amount of cabbage as you desire for the amount of chicken used. Some people like less cabbage and more chicken. Cook the chicken in chicken broth for more flavor, then use the cooking liquid to make soup. You can make the dressing, toasted noodle mixture, chicken and cabbage in advance and toss them together at the last minute for a nice crisp salad. You could optionally add cashew nuts to the salad.